A warm classic! In chilly conditions, Liners like this one added much-needed insulation to a crewman's Coveralls, without adding unnecessary bulk. 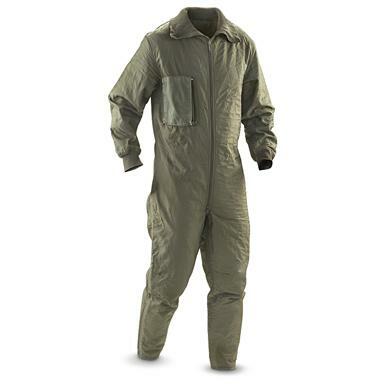 German Military Surplus Tanker Coveralls Liner, New is rated 4.7 out of 5 by 17. Rated 5 out of 5 by Kris from Perfect coverall liner Thick and warm. I am 6'1" - 187lbs. and the Large fits perfect. Fantastic deal and is brand new. Nice! Rated 5 out of 5 by SGMTChinook from Get These and Stay Warm! Superb Value!Perfect for under a sled suit!Can also wear these around the house instead of sweats during the winter. Step in, zip up, keep warm.Imagine a quilted coat liner made into a one piece with stretchy cuffs and neck. Tapered legs with zippered closures (wish they would've stuck with the stretchy stuff at the ankles).Too bulky to wear under a uniform. Rated 4 out of 5 by KGBFarmer from Work fine Bought these for my son to wear when he puts hay out for cows during winter months. He reports they are warm and holding up well. Rated 5 out of 5 by Louie X from Getting the right size. This product is exactly what I wanted. I am 5'7", 170 lbs., with a 42" chest and SIZE L (LARGE) fits me exactly. I am a thinner, short guy, by no means large so let this be your guide. Warm and flexible without breaking in time. Rated 5 out of 5 by VietVet68 from Great price, excellent fit I bought this for winter outdoor work here in upstate NY. After reading some of the other reviews I ordered an x-large. I'm 5'10", 170 lbs and this thing fits perfectly. I liked it so much I bought a second. With a little layering it stands up to the coldest days outside. Great deal. Rated 4 out of 5 by J208 from Great quality & great price! High quality and well made! Great quality at a cheap price. These do run a little small. Would recommend ordering one size larger.